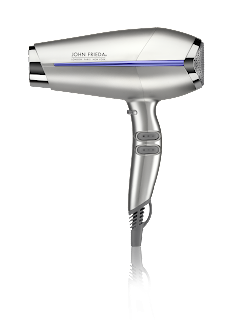 I wasn't planning on reviewing my new hairdryer, the John Frieda Salon Shine Ionic Hairdryer, on here, presuming that it wouldn't be a topic which people would be interested in reading about. After all, I've always purchased hairdryers based on the in-store offer or received as a Christmas gift and only tried this after being gifted it by the PR. However, when a friend recently asked me for my recommendation, I decided to run this post. I have fine hair but quite a lot of it. Although it tends not to take too long to dry, it is susceptive to frizz. So, would a hairdryer make a difference? Quite simply, yes. But let's start with the design itself. A sleek silver colour which looks smart, I like that it's comfortable and lightweight to hold. There are 3 heat settings and 2 speed settings and the 2200W dryer has a professional, salon quality motor. The cord is also quite long (3m) which is handy for me as my electrical socket is the other side of my bedroom to my mirror. I've timed how long it takes me to style my hair using this and it took just 3 minutes, an improvement on my standard hairdryer and perfect for when I'm getting ready in a hurry. I really feel that it delivers on claims of creating smoothness and shine and whether or not this is actually down to the "advanced ionic technology" (the hairdryer releases a stream of ions to surround and condition each strand of hair, neutralising static, smoothing the outer layer of the hair cuticle and controlling frizz), it's made a huge difference to my naturally frizzy hair. I like that the cool air shot genuinely does give a blast of cool air to help set styles. I'm so impressed with John Frieda Salon Shine Ionic Hairdryer and honesty don't know how I ever lived without it. I'd highly recommend it, particularly if you naturally have thick or frizzy hair. At £60, it's not cheap so it might be worth shopping around for offers or buying when Boots are running an advantage points promotion.